After School Session is a generous and brassy cull of correspondence from Brett Evans to Brock Downs. The poems are a direct jack into the miniamp of postcard art sent between two friends; they hit hard in an open-all-night punk rock show for the audience of one. Like the form of Kerouac’s Mexico City Blues, limited by the small size of a breast pocket notebook, Evans’s gumbo is cooked in the scant pot of the postcard—an ‘afterschool rest stop of the imagination / real special.’ The poems offer one slamming and damming notation after another. Down’s artful arrangement and selection should stand as a model for what one can do with our hazardous mail. 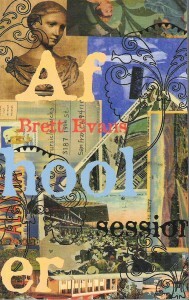 Brett Evans’s work has been featured in the anthologies The Gertrude Stein Awards in Innovative American Poetry, Another South:Experimental Writing in the South, and Poets for Living Waters. It also appears in the biography Ernie K-Doe: the R&B Emperor of New Orleans. He is a regular contributor to One Fell Swoop, Lungfull!, and unarmed magazines. Other books of the author include Slosh Models, Ready-to-Eat Individual (with Frank Sherlock), and After School Session , as well as the chapbooks Ways to Use Lance and Pisa Can. A member of the bands Skin Verb and Splinter Group, he lives on the lee of the Bayou St. John levee in New Orleans, LA.